Vertagear SL5000 Series ▷ Size & Buying Guide on GOTURBACK.UK! It’s true that you can use just about any chair for gaming – you can even sit on an upturned box if you have to – but your chair can make a significant difference in your game play and enjoyment. If you go into a game dreading future back pain, the whole thing will be ruined. That’s why it’s so important to find the right chair for your build and gaming needs. You want something durable, robust and comfortable. Your chair is there to support you, and if you’re willing to forego fancy add-ons in the name of comfort, then Vertagear’s SL5000 series may be a good match for your needs. It doesn’t come with fireworks, so to speak, but it’s a good quality option built on a tough steel frame and a Class 4 Gas lift. For a mid-range price tag, you could do a lot worse. SL5000 gets full points when it comes to appearance. It’s designed on the basis of a racing-style car seat and looks very sleek. It is covered in quality, easy to clean, imitation leather. If ever there was a chair that looks like it means business, this is it. But you don’t pick a chair based on looks, so let’s see how it holds up in terms of features! Firstly, like other chairs in its price range, it offers ergonomic, adjustable 4-D arm rests and seat height (using the class 4 gas lift) to help maintain the right posture and support for your build. The seat, back and arm rests are also cushioned, supporting back and arms. And there is a lumbar and neck pillow. There is lockable rocking and the backrest reclines by 80-140°. The chair’s weakness is that is has too much clearance, so that when you move about and shift your weight, the whole seat moves with you and can feel unsteady. The SL5000 is well-padded for comfort, using high-density foam an open-cell breathing structure which does not lock in body temperature: meaning, you remain cool even when playing for hours. This model does not take up a lot of space, so it should fit well, no matter the size of the room: it measures 51.99 cm x 53.01 cm x 1.4 m and weighs 26.76 kg. It is also fairly quick and easy to put together, so you don’t have to be a DIY genius to assemble it. The SL5000 used to be available in black only, though it is now also available in black-white, black-blue, black-green and black-red. This is a more modest range of options than in Vertagears other models and other chairs in the same price bracket. However, the colours on offer do look very good on the chair. The package includes an accessory kit of all the tools required for assembling an SL5000. 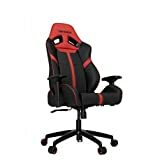 There are no other accessories, but the chair height is adjustable, and it comes with an adjustable neck pillow and Lumbar pillow which attach with elastic straps. As with other features, SL5000 is a bit of a mixed bag. It comes with a high back rest means good back support even for tall players. The seat and backrest are padded with thick, supportive foam, but the backrest is quite narrow, and taller or more strapping builds might find that the padding makes the chair feel too narrow. On the positive side, the steel frame, aluminium base and strong cylinder can support up to 150 kg, which means that you’re unlikely to face issues with a cracked base or failed cylinder. The armrests and back can be shifted to provide more room: SL5000 measures 50cm at shoulder level and 38-43cm wide at the seat, with a depth of 58.5cm. The height spectrum lies between 1.70m and 1.90m, and the load capacity is between 60kg and 100 kg. Basically, if you fit into this range, you’ll have a comfortable time playing in the SL5000, if you prefer more room, it’s best to choose a less cramped model. Reclinable to 135 degrees, with arm rests adjustable in 4 dimensions for flexible adjustment options.